Is Your Home Beginning to Smell Like Burning Wood? Home/Consumer Info, Frequently Asked Questions, Residential Duct Cleaning Articles, Seasonal, Uncategorized/Is Your Home Beginning to Smell Like Burning Wood? Is your home beginning to smell like burning wood? Has the winter season begun and the smell of your fireplace is becoming more overwhelming the more it’s used? There are a number of reasons why this could be happening. If your fireplace hasn’t been cleaned recently or at least regularly, that could be causing a heavy soot smell in your home. Also, if it has been cleaned. After use it could just be rerouting the smell from the chimney throughout your home. Look to see if there is a return vent anywhere in the same room as your fireplace. Is there a return in any conjoining room? After use, your fireplace can give off a smell of burning wood that can be sucked back through your system’s return ducts. Clean your fireplace after use, and before your first use at the start of the chilly seasons. When not in use, make sure you close your fireplace damper. The smell of the chimney could sink back into your home through your return. In addition, you can use an air freshener in the fireplace to absorb some of the smell when it’s not in use. More often then not, following these few steps can keep your home from smelling like burning wood and creosote. The smell can be unpleasant, and even nauseating when heavy. The NFPA (National Fire Protection Agency) suggests that you have your chimney cleaned, inspected, and repaired annually to avoid issues. 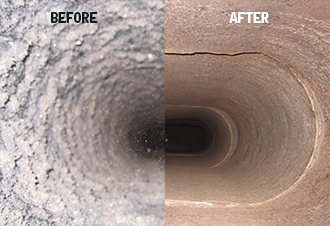 Advanced Furnace And Air Duct Cleaning not only will clean your ducts, but we also clean fireplaces as well. The cold weather has finally hit. It’s becoming the time of year when you are going to want to fire up your wood-burning stove and get cozy. The last thing you want is the smell of your fireplace to linger afterwards. So call Advanced today at 1(800) 317-7104 and get your winter started right!